I made chocolate zucchini bread for breakfast yesterday. Chocolate for breakfast? Why yes I did. Warm bread, fresh out of the oven and filled with shredded zucchini…I refuse to feel guilty, even if it’s laden with rich chocolate flavor. First, I have a confession to make. I don’t like zucchini. It’s never been my favorite vegetable. There were a lot of vegetables I didn’t like as a kid that I love now, but zucchini didn’t make the cut. In fact, most summer squashes didn’t. 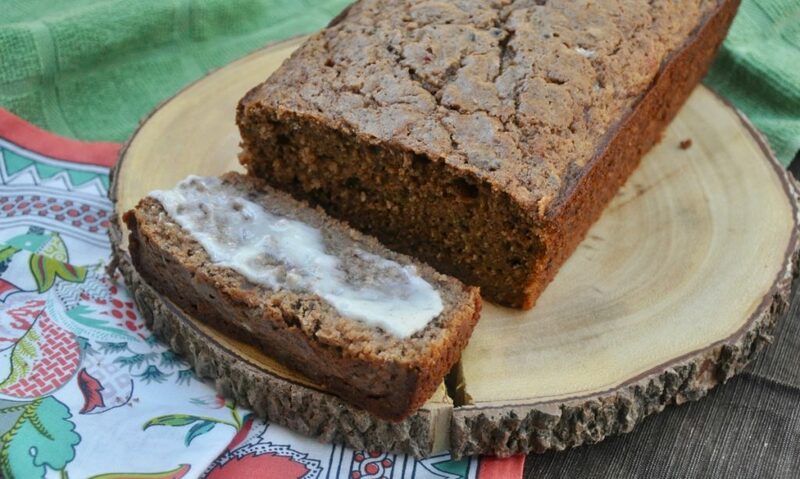 But I did discover growing up that I liked zucchini bread. It’s moist and delicious and nothing like zucchini. Then in college, I discovered chocolate zucchini bread. Even better! I mean, what could go wrong when you include chocolate, right? In the interest of full disclosure, I should also add that in the last year I have discovered that I like zucchini boats, as long as they are not overcooked. I even put a Philly cheesesteak zucchini boat in my cookbook that I am absolutely addicted to. The bottom line is that if you’re going to chop up zucchini and overcook it and serve me mush, I’ll pass. But if you put it in a bread or keep it fairly crisp when cooked with a savory filling, I’m all in! I actually grow zucchini in my garden just for the zucchini bread. When it’s ripe I just shred and freeze it. I freeze it in Ziploc bags that are premeasured for the amount I’ll need for my zucchini bread so I can just pull a bag and thaw to make zucchini bread year round. It works great since I normally want it in the winter anyway. *Money saving tip* – If you don’t grow zucchini, you can find it on sale pretty cheap in the summer. Buy it when the price is low and shred and freeze it so you have it all year long for zucchini bread. Then you’re never paying the most expensive prices for it. Did I mention you can make it the night before and have breakfast ready the next morning? Or serve it for dessert! The recipe makes two loaves and you can wrap one and freeze it if you don’t need both right away. I love that. 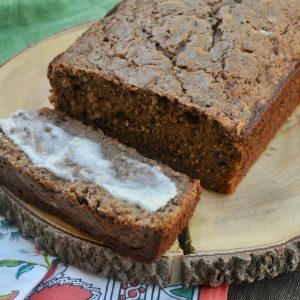 With this chocolate zucchini bread recipe I don’t even feel guilty feeding my kids chocolate for breakfast. ;). I’ve tested and made it over and over with the intention of finding the maximum amount of zucchini I can fit into the loaf and still have it be delicious. The recipe calls for 3 cups of shredded zucchini but I have put in 4 cups before and it was still fabulous. Do you like the idea of the chocolate and zucchini combo? Then you might like these Mexican Chocolate Zucchini Cupcakes with Cocoa Tajin Buttercream! Do you like zucchini? Let me know your favorite way to eat it in the comments! 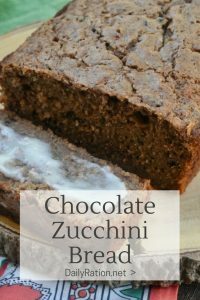 Rich chocolate flavor and tons of zucchini lets you indulge in this warm, comforting bread without feeling guilty. 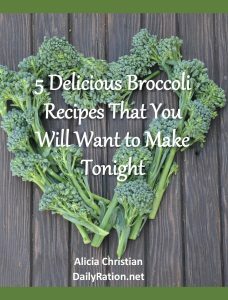 Kill a chocolate craving while getting in your vegetables! What could be better? Preheat the oven to 350º and grease 2 9x4 loaf pans. Mix all the dry ingredients, minus the sugar, in a large bowl. In another bowl, mix melted butter and sugar. And eggs and milk and mix in well. Alternate adding half the butter mixture and half the zucchini to the dry ingredients. Mix but be careful not to overmix. Repeat with the other half of the butter mixture and zucchini. Pour into the two greased loaf pans and bake for 50 minutes to an hour. When a toothpick poked in the middle comes out clean it is done. Let cool completely. It tastes even better the second day!